The MK-770 EXP Tile Saw by MK Diamond is the improved version of the MK-770 Tile Saw. Boasting pro-grade design features, the MK-770 EXP has become a staple wet tile saw choice among professional craftsmen. 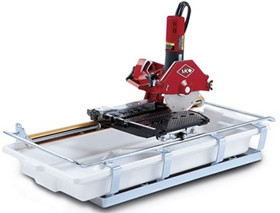 With its user-friendly features, the tile saw is also simple and easiest enough to use for the DIY enthusiast. With twice the horsepower over its predecessor, the MK-770 EXP features a powerful, high-torque 1-1/4 HP motor that smoothly cuts a variety of materials including tile and marble, making it ideal for construction, renovation, and home improvement projects. With a 7” blade capacity that spins at 6,000 RPM, the tile saw cuts tile up to 20” in length, 14” diagonally, and up to a 2” depth of cut. Built with innovative features, the MK-770 EXP Tile Saw is designed for precision cutting, and with a range of cutting options, the saw will bring the versatility needed to each job. Precise 45-degree angle cuts become an easy task with the fully adjustable, built-in miter system that features a single adjustment point for quickly positioning the blade to an exact 45-degree angle. With a variable height cutting head, the tile saw performs plunge cuts as well as being able to accommodate blades smaller than 10 inches in diameter. The MK-770 EXP is engineered with durability and convenience in mind. Precision alignment and cutting are ensured with the chrome guide-bar and linear-bearing assembly. 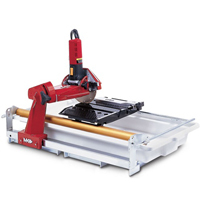 Weighing only 57lbs, and with a small and compact frame, the tile saw is easily transported and maneuvered. The zinc-plated steel frame and cast aluminum components are built for strength and lasting durability through each job, and with the hinged blade guard, blade changes and maintenance inspections are quickly and easily performed, increasing efficiency and productivity. Engineered to be a powerful, yet user-friendly wet tile saw, the MK-770 EXP by MK Diamond is a workhorse built to get the job done. Maintenance-free, self-lubricating pinion and gear-box assembly. Built-in fully adjustable miter system for precise 45º angle cuts. A single adjustment point permits the orientation of the blade to an exact 45º angle in seconds. Variable height cutting head allows for plunge cutting and use of blades smaller that 7″ in diameter. Chrome guide-bar and linear-bearing assembly ensures precise alignment and precision cutting. Hinged blade guard for easy blade changes and maintenance inspection. New zinc-plated splash cover protects motor from water mist. 7″ wet cutting continuous rim blade & submersible water pump included.